FDA, tear down this wall! The wall between pharma and the Internet. For too many years the FDA has neglected to issue guidance to the pharma industry on how it will enforce its regulatory authority over Internet-based promotions. Instead, FDA seems to depend entirely on formulating policy by issuing warning letters. In contrast, FDA has often issued specific guidance with regard to TV and print advertising. The FDA defends its lack of Internet guidance by saying that the same principles apply to the Internet as apply to other media. That argument is not rational nor is it an extension of how the FDA treats other media, such as broadcast TV. The FDA, for example, has long recognized that there are limitations inherent in a 60-second TV commercial that required it to issue guidance on how to comply with fair balance regulations when using that medium. Similarly, there are limitations inherent in a 70-character Google adword. Yet the FDA refuses to issue any specific guidance for the use of adwords by pharma marketers. Let's continue to focus on adwords as just one specific example of how lack of guidance from the FDA has caused problems. Without specific guidance from the FDA, pharma marketers came up with their own rules for how to use adwords and remain compliant with FDA regulations. One such "rule" was the one-click rule. The recent issuance by FDA of 14 letters against that practice, however, proved how slippery the slope is when pharma marketers are left without specific guidance on what's acceptable and what's not acceptable on the Internet (see here). Now, pharma marketers have come up with another "rule" or work-around: the use of "redirect" URLs in adwords (see here). The question remains, however, how will FDA interpret this practice in the future? Is FDA right now drafting warning letters against this practice? There are probably many other examples that could be cited demonstrating how the Internet is unique from other media and deserves special guidance from the FDA. This is especially true when considering Web 2.0 applications such as social media. We may not know all the possible unique ways in which pharma marketers can get into regulatory gray areas on the Internet. It's possible that the FDA itself cannot foresee all these gray areas. Maybe that's why it is reluctant to issue guidance. Lack of knowledge of new technology and how it is being used by consumers, pharmaceutical marketers, health professionals and other stakeholders should NOT be an excuse for FDA's lack of guidance in this area. That is why it is necessary for the FDA to convene a PUBLIC HEARING where ALL stakeholders can participate in a discussion of the issues and provide the FDA with a good understanding of the Internet as it exists today and tomorrow. That understanding and knowledge can then be the basis for issuing guidance that will allow the pharmaceutical industry to contribute to the conversation online. More and more patients are seeking health information online and through social networks of their peers. Guidance from the FDA on the use of these media by pharmaceutical companies will help empower these patients with accurate information from manufacturers rather than relying upon unsubstantiated claims made by anonymous online sources. Any public hearing today would have to include health and medical bloggers and other citizens engaged in social media that reaches out to patients and consumers. It would also have to include technology companies that did not exist in 1996 (eg, Google!). Only through such a diverse group of stakeholders can the FDA get a well-rounded picture of the importance of the Internet -- and especially social media -- in improving the health literacy and well-being of patients. That is the best basis upon which to develop draft guidance for use of the internet by pharmaceutical marketers. 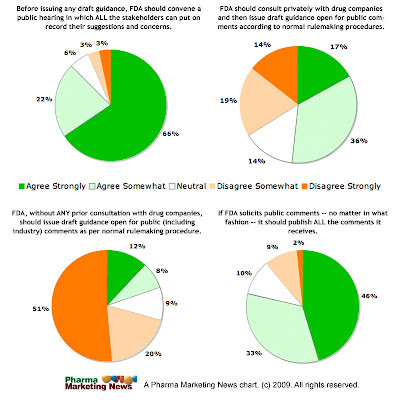 SURVEY: Should FDA Convene a Public Hearing on Use of Social Media by Pharma?